Having booked our table for 7:30pm, we didn't get to the restaurant until 8:00pm. Despite leaving early, there were virtually no available parking anywhere near the restaurant so we had no choice but to park in a really expensive parking lot that was a 10 minute walk away. Which did annoy us a little bit but as soon as we got to Bodega, the place was bustling with energy and made us forget about our parking palava. We were then seated quite quickly by the welcoming staff before feasting our eyes on the food and drinks menu. For drinks, Bodega has an extensive menu full of interesting cocktails. 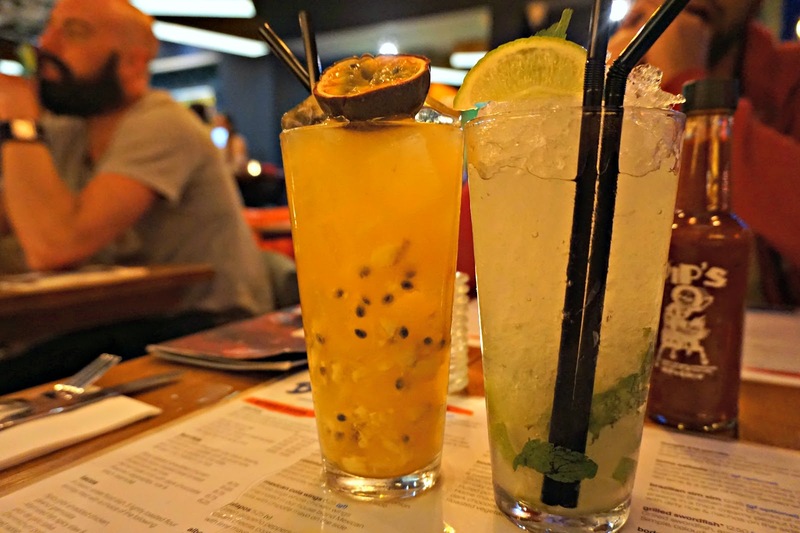 We went for Rum Number 6 (Doorly's 5yo rum served long over muddled pineapple and ginger with passionfruit and mango juice - £6.50) and Mojito (Fresh lime chunks and sugar muddles with mint, Havana 3yo rum and topped with soda - £6.50). Both were really nice and refreshing! I did enjoy Rum Number 6 a lot more though, but that's only because I prefer fruity cocktails. 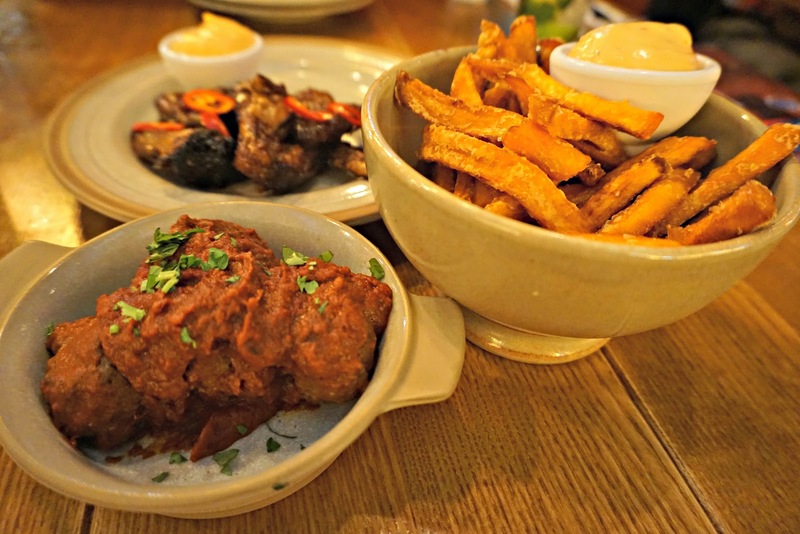 For starters, we went for the Mexican Cola Wings (Three large whole chicken wings marinated in house blend Mexican cola with Chipotle mayo on the side - £6.25), Batatas Fritas (Sweet potato fries with Chipotle mayo - £3.95) and the Albondigas Cubanas (Homemade spicy beef meatballs served in rich mole sauce). If you know me, you'd know that wings is my thing. If there's a starter on any menu that has a chicken wing option, it's mine. With the Mexican Cola Wings, it was sweet, sticky and had a bit of a kick to it. I didn't even dip it in the Chipotle mayo that it came with because it was full of flavour. Seriously, the wings were so on point to the point where I actually wished it was a main. The other starters that we chose were also nice, the sweet potato fries were nice and crispy, which was enjoyable to snack on whilst we were waiting for our mains. The meatballs weren't our favourite starter out of the three. It was tasty, don't get me wrong. However, as we were expecting to taste something different with the 'mole sauce', we were a little disappointed to taste something that tasted very similar to bolognese sauce. 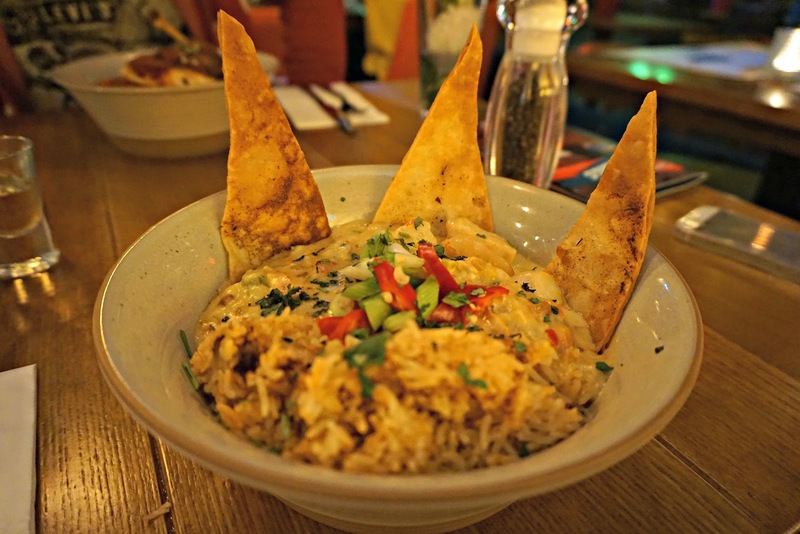 For mains, I went for the Brazilian Xim Xim (Chunks of chicken & prawns in a thick creamy peanut butter sauce with dirty rice & nachos on the side - £12.95). I was quite surprised at how much I liked this dish. I absolutely love peanut butter, so I was pretty skeptical with how it'll taste as a sauce with meat and rice but it worked! 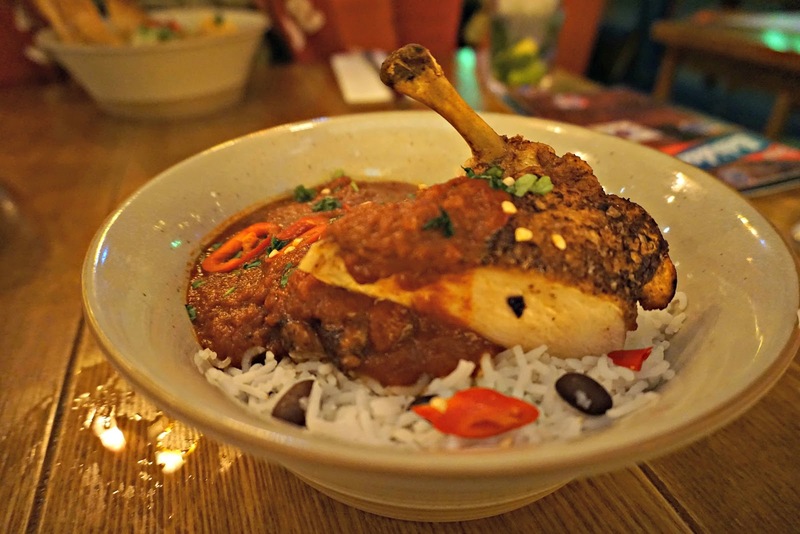 Sat went for the Venezuelan Chocolate Chile Chicken (Chicken breast in a deep, rich sauce consisting of orange, sugar, fresh tomatoes, dark chocolate served with rice and beans - £12.50). Putting chocolate and chicken together doesn't sound great but after trying the dish, I was rather surprised. You can't taste much of the chocolate due to the tanginess and spiciness, which I think was good because any more of the flavour could've potentially put us off. So Bodega did a great job with getting the balance of the flavours right. Alongside good food and amazing cocktails, the atmosphere of Bodega in Leicester definitely made our dining experience so much more enjoyable. The staff were incredibly helpful and knew literally everything about the menu (not the umming and ahhing type)! Overall, I had a really great time at Bodega and I really would encourage you all to go try out their food. If not, why not go try out their cocktails? Come on, you know you want to. 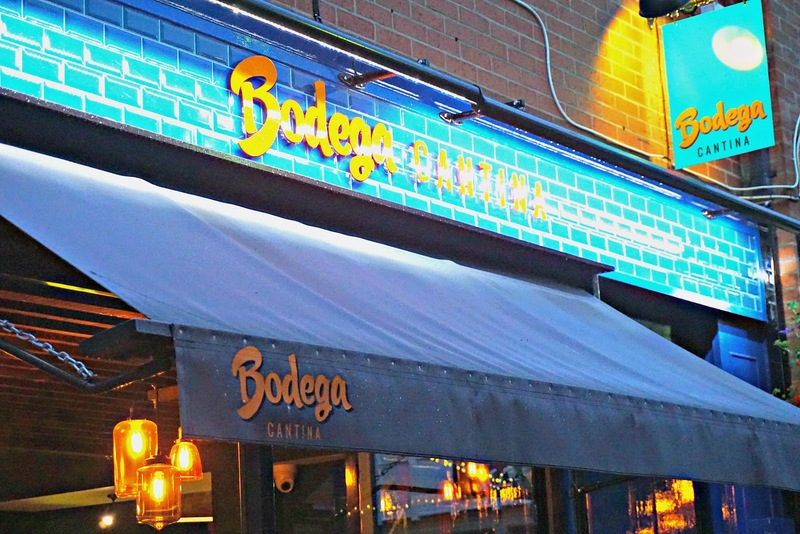 Have you ate at Bodega before? What do you think of South American food? *Food and drinks were all paid for by Bodega. All views and opinions are my own.